A confident, focused, fit, respectful, happy young person... This is what we aim to achieve for every child that walks through our door. Our classes are fun and exciting, with life skills built into the mix. Our parents frequently tell us how their kids evolve within a short amount of time - they gain a better overall attitude and an increased drive toward getting good grades. Parents are thrilled with us, and we're honored to be part of their child's improvement. After all, they're the future of our community! Our goal is to create an atmosphere where teenagers can feel safe and comfortable just being who they are. In these classes, everyone works together and supports each other. An emphasis on leadership skills gives students the ability to flex their social muscles, trying out different ideas and ways to inspire other students to be their best. The teenagers in our classes are smiling, confident, and ready to tackle anything! Welcome to our own brand of Fitness Martial Arts! We have an excellent fusion of cardio, strength training, flexibility, and martial arts training. Each class involves a sweat-inducing workout, and you'll also enjoy achieving your goals as a martial artist. Learn critical self-defense skills, achieve the commanding presence of a martial artist, and enjoy increased confidence, all while getting physically stronger and more fit. This is quite the adventure. Come in and take that first step to becoming a better you! We want you to be confident, and know that you can be strong and assertive in any situation. It can be a scary world out there, and we designed a self-defense curriculum that's for anyone. So if you’re not able to attend our classes and commit to a martial arts way of life, you can still learn critical skills that will make you more aware of your surroundings, detect potentially dangerous situations, understand how bad guys operate, and have a fighting chance in the event of an attack. Martial arts isn't just about learning how to block, kick, punch, and do cool moves and tricks. All that's completely cool, yes, and we enjoy that very much! The best part of martial arts is what it gives you as a person: humility, focus, respect for yourself and others, confidence, community mindset, a commanding presence, and all of this boils down to excellent LEADERSHIP SKILLS. We believe in the benefits of these attributes to our community, and that's why we're passionate about it. We have been doing this for a long time now - since 1997 - and we have heard so many success stories about our students as they grew into (or continued) adulthood. Come in and enjoy what we have here. Gain critical life skills, become stronger and more fit, make new friendships, and have fun! Quality instructors bring quality students. The Values one learns in Martial Arts make for strong families and people with a strong sense of purpose and respect. 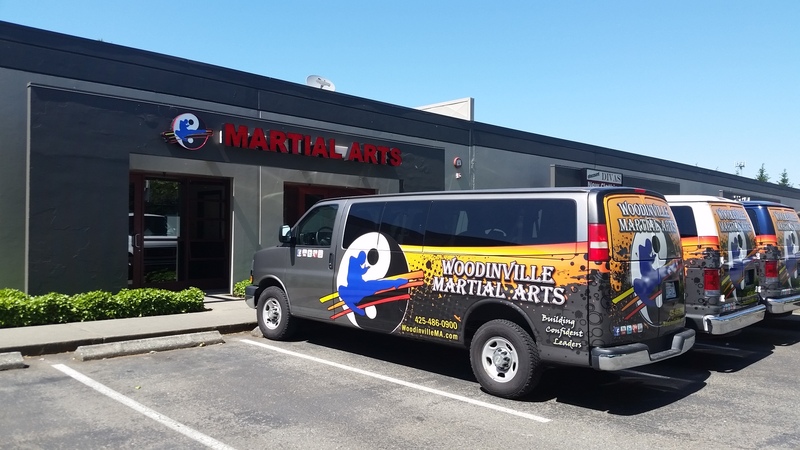 That is certainly evident with Woodinville Martial Arts. Somehow Master McCarter inspires dedication and great values while teaching them their forms and playing games. The kids are well behaved and respectful while getting fit. Who could ask for more? Our shy daughter started training here several years ago. She has blossomed into a confident, kind and active individual. Master McCarter's style of teaching is supportive, kind and disciplined. Our daughter loved training there so much, both of us have joined and have been training in the adult class! It's been a great way to get in shape and learn techniques in self defense. Most of all, we have fun! I spent over a year looking for a "perfect instructor" and interviewed many other centers from Woodinville to Bellevue. I don't think you can find better instructors for kids or adults than you will find here. The energy is amazing, encouraging, powerful and kind! The McCarters are an awesome team and it's an honor to have my 11 year old son be a part of their team!